C.H. 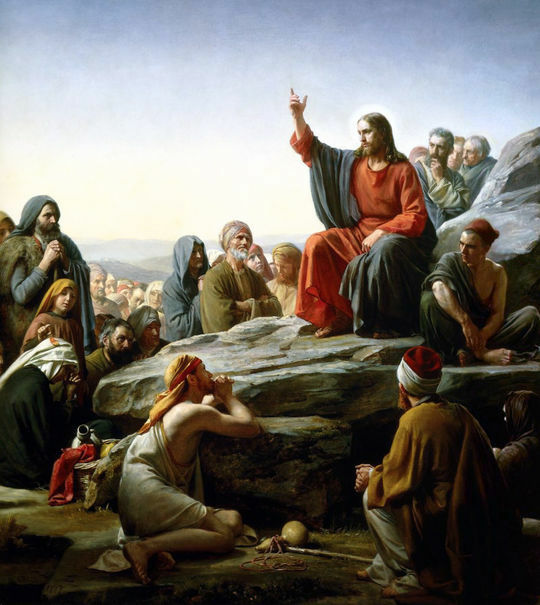 Bloch, “The Sermon on the Mount” (1877). Oil on brass. But I say to you that everyone who divorces his wife, except on the ground of sexual immorality, makes her commit adultery. And whoever marries a divorced woman commits adultery. But I say to you, Love your enemies and pray for those who persecute you, so that you may be sons of your Father who is in heaven. For he makes his sun rise on the evil and on the good, and sends rain on the just and on the unjust. For if you love those who love you, what reward do you have? Do not even the tax collectors do the same? And if you greet only your brothers, what more are you doing than others? Do not even the Gentiles do the same? Beware of practicing your righteousness before other people in order to be seen by them, for then you will have no reward from your Father who is in heaven. Thus, when you give to the needy, sound no trumpet before you, as the hypocrites do in the synagogues and in the streets, that they may be praised by others. Truly, I say to you, they have received their reward. No one can serve two masters, for either he will hate the one and love the other, or he will be devoted to the one and despise the other. You cannot serve God and money. Therefore I tell you, do not be anxious about your life, what you will eat or what you will drink, nor about your body, what you will put on. Is not life more than food, and the body more than clothing?